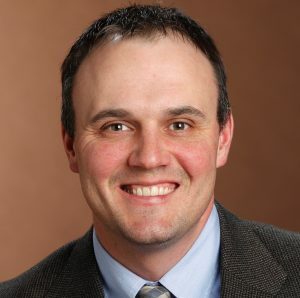 Ryan Wagner of Roslyn was elected to serve on the South Dakota Corn Utilization Council’s board of directors beginning in March 2014. Wagner says one of the most important issues corn producers are facing is demand, noting that exports dropped considerably when corn prices were high. Other challenges facing farmers are achieving consistent yields year after year and dealing with the threat of weed resistance. Wagner said genetics have come a long way in recent years and continued research will be vital. The Roslyn High School graduate earned a degree in mechanical engineering from South Dakota State University in 2003. He worked at Daktronics and then for Tyson Meats before returning to the farm. He grew up helping his dad, Terry, on the farm and always knew he would return. The Wagners use a rotation of 40 percent corn, 40 percent soybeans and 20 percent spring wheat on their farm. Their operation has been 100 percent no-till since the late 1980s or early 1990s. Wagner also is a commodity broker. He was a member of the sixth class of the South Dakota Agricultural & Rural Leadership program, is a member of Farmers Union, is an investor in Glacial Lakes Energy and serves as president of his church council. When he has spare time, he likes to bow hunt and fish when possible, and also read. He and his wife, Kerri, have three children: Grady, Anna and Harrison.